An avid horse woman, Anne Vawter, Owner and Winemaker, named her wine label in honor of her red mare, Paradigm, who was a bonus given to her during her time at Paradigm Winery. 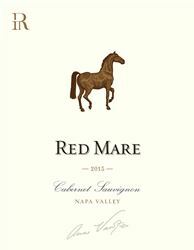 The inaugural release of Red Mare Cabernet Sauvignon, the 2007 vintage, sold out in just two months. In addition to her Cabernet Sauvignon, Anne also produces a Napa Valley Sauvignon Blanc and has recently added a Sonoma Chardonnay. Anne sources fruit meticulously from very small, well-respected vineyards throughout the Napa Valley, from a cool enclave of the Carneros to a hill top in Coombsville, and northward on the Valley floor in Oakville, Rutherford and St. Helena. Her 2011 Chardonnay hails from a choice location in the famed Russian River Valley of Sonoma. Anne looks for vineyards with unique qualities and distinctive character that will come together in the blend to produce a layered and beautifully balanced wine. To join the wine club, visit www.redmarewines.com or call 877-310-3335. For those who want to make sure they have the opportunity to get Red Mare every year we have an allocation club. Members of our "Triple Crown Club" are the beneficiaries of 3 great rewards; guaranteed access to the wines, a 10% discount on all wines and invitations to our club events.